Is there a business case for IPTV in Middle East? – Case Study. IPTV has been one of the telecommunication hypes with higher trough of revenue expectations and business stimulation. However, IPTV is still a revenue innovator promise as very few countries reach the minimum level of penetration to defend the case. There are few out-performers in the telecom space where IPTV’s take-up reflected a substantial contributor to growth. In the European market, few operators have built household penetration above 10% within three or four years. All others have household penetration of less than 10%-5% in several instances. No European or North American incumbent is showing any signs yet of reaching the 31% penetration level that PCCW has in Hong Kong for its IPTV offering (Now TV). Slow uptake of IPTV and reduced ARPUs . Most of TV markets are already mature, often with well-established DTT, DTH, and cable TV offerings. It’s a challenge for telecom operators to break into these markets and win market share and gaining market share is no guarantee of high ARPU. With some exceptions, IPTV ARPUs are generally lower than the average pay-TV ARPUs. Premium content is a vicious cycle. One reason IPTV ARPU is low is because few operators offer as much premium content as competing pay-TV players. Operators looking to improve ARPU may face a vicious circle—they lack the scale to justify the high cost of premium content, but without it they lack the compelling content proposition needed to build scale. In addition, in most of the emerging markets, local content is significantly more important than international content. Increasing “Cutting the cord” effect. The “cutting the cord” effect unveils as the most fundamental change that threatens operators’ efforts to generate value from IPTV & VOD services. A growing proportion of video consumption is moving to ‘over-the- top’ services that are delivered across the open Internet rather than over operators’ dedicated IPTV or VOD platforms. 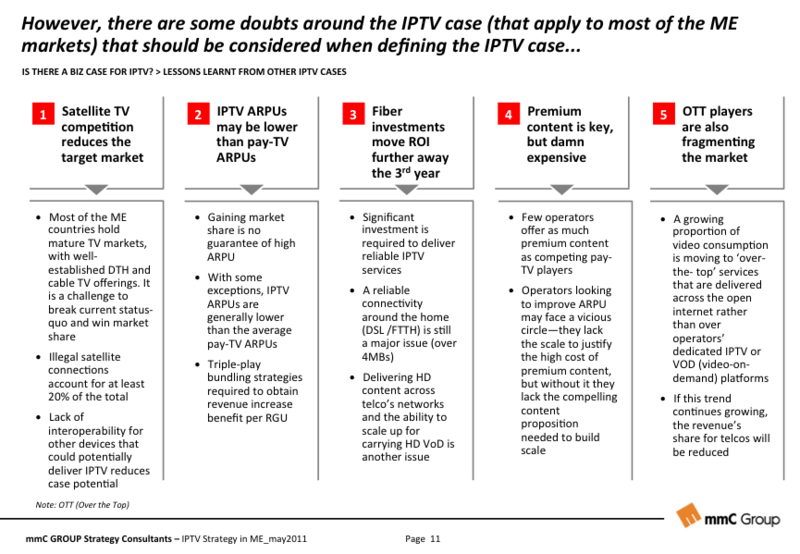 The question is: Is there a business case for IPTV out of mature markets like the Europeans? 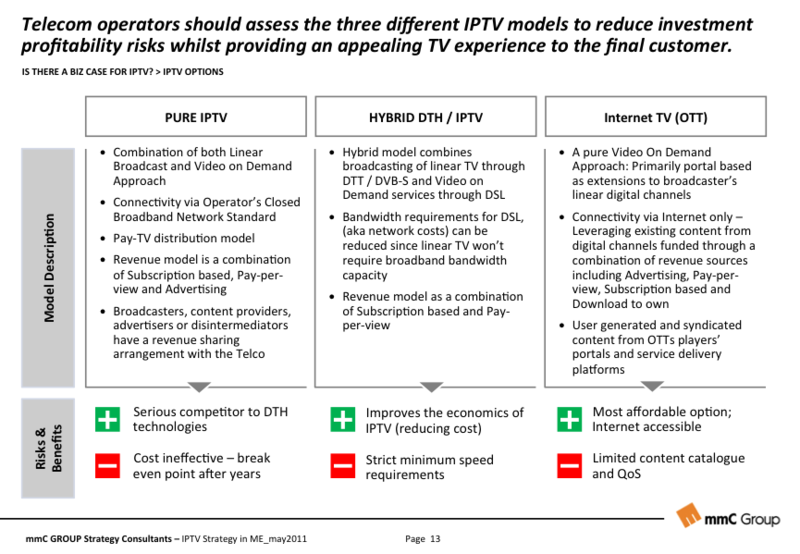 In our opinion there are some doubts around the IPTV case (that apply to most of the ME markets) that any telecom operator should consider in advance. 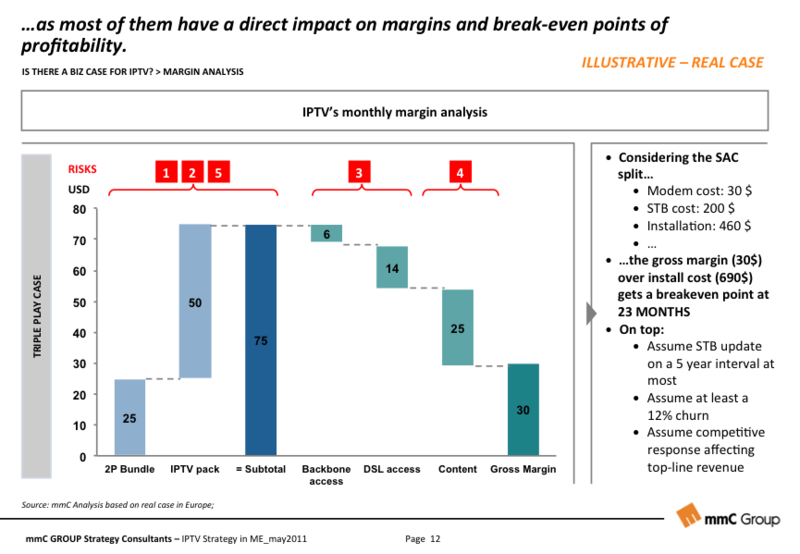 Aspects like Satellite TV competition, IPTV arpus dilution, fiber deployments and impact on ROI, premium content and OTT competition may seriously affect the business case as they have a direct impact on margins and break-even points of profitability. Depending on the scenario selected, the investments required will be different. The current tendency is to define tight cost control mechanisms to avoid CapEx burn optimizing OpEx spending (accepting that most of the operating cost might come from the content side and this will be hard to optimize) while defining a segmented and pricing-innovative approach to gain market share, increase ARPU levels an reduce abandonment. In our opinion, there’s a business case for IPTV in the Middle East. Operators should successfully attend the different challenges that separate success from failure, and learn from others’ success experiences and lessons learnt. Please follow the case study bellow to get mmC Group’s insights on the topic based on different assignments executed in Africa and ME.